Mr John Bethell was a 15 year old scout at the 65th Birkenhead Troop now known at the 265th. On a night of very heavy bombing 13th/14th March 1941, he was working as a volunteer messenger boy as did many thousands of scouts during the Second World War. On the night a house in the Oxton area of Birkenhead took a direct hit as John and his two Fire Wardens where in the road out side. The blast from the bomb blow them through the air across the road, John got up and ran into the burning house ignoring the Fire Wardens not to go. He did and brought out two old ladies from the kitchen, having got them to safety the house behind them collapsed in on its self. For his bravery John was awarded the highest honour in scouting The Bronze Medal equivalent to The Victoria Cross. He was then chosen from Boy Scouts country wide to represent Great Britain to travel throughout Canada and the United States of America lecturing and broadcast on what it was like to be bombed night after night in London, Glasgow, Southampton and Merseyside. For three months they traveled before coming home and being met by the then Deputy Prime minister they then spend a further two weeks continuing their tour through the British Isles. At the age of 18 John was called up and joined the Signals Regiment and saw service in Italy and the Far East, after the war he stayed on to help set up the telegraph with the Burmese and India staff. John then transferred and worked the test of his life for NATO. Living between France and the UK till his passing in April 2017 aged 91. In this Will he left his Medals the Scout Group he had joined as a lad and at the Service of Remembrance it was fitting the his good friend Commander John M Bingeman and his wife Jane brought his Memorabilia to the service. 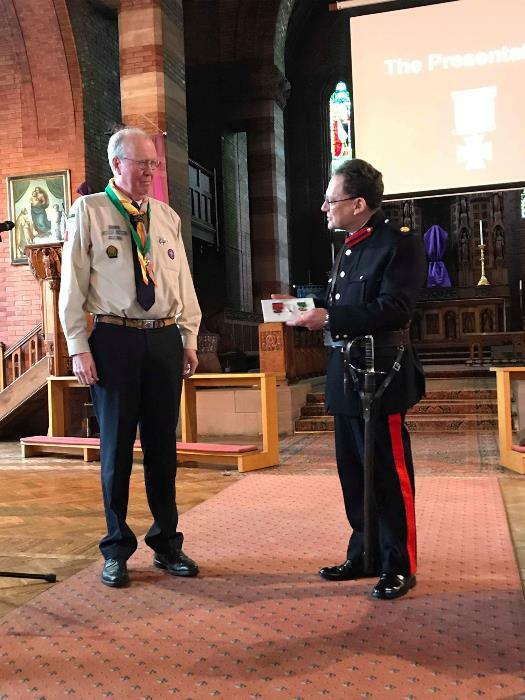 The Scout Group where honoured to have The Deputy Lord Lieutenant Dr N Jedynakiewicz present the Medals to the 265th received into safe keeping by the Group Scout Leader Mr John Bridgwater. Also in attendance where the Deputy Mayor of Wirral, Councillor Geoffrey Watt, and his wife, there was also County and District Scout representatives. 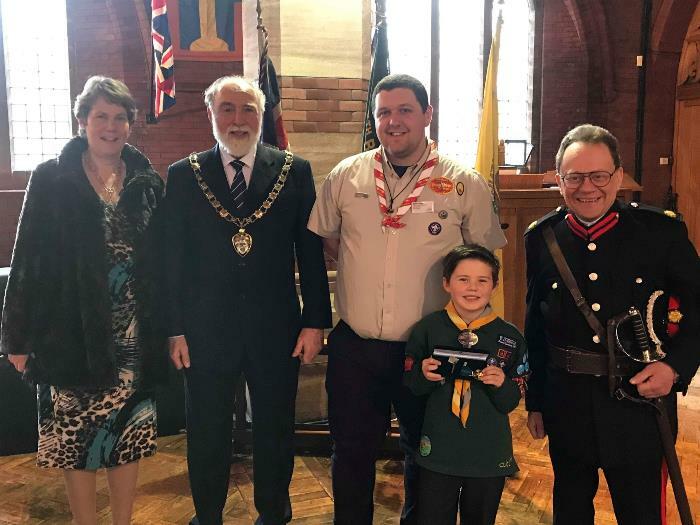 The service was a fitting way to celebrate John's life and we took the opportunity to have the Deputy Lord Lieutenant present a Scout Bravery Award to one of our own Cub Scouts Lachlan from our Chief Scout, Bear Grylls for his Bravery in recognition of Lachlan's calm and mature response when his Father suffered a cardiac arrest. The 265th Group would like to thank the Lord Lieutenant for allowing his Deputy to attend our service.